With Therefore™ information management solution, you can revolutionize the way information is managed throughout your organization. Therefore instantly provides your employees with the ability to capture, archive, retrieve, edit, and process documents and information quickly, efficiently, and securely, helping you to enhance productivity and reduce costs. Therefore speeds up your business cycles and generates a fast return on investment. By increasing the level of electronic information processing you benefit by decreasing your print and output costs. The eCopy ShareScan line of document imaging solutions from Canon sets competitive benchmarks in security, application connectivity, innovative workflow processing and user-friendly design. 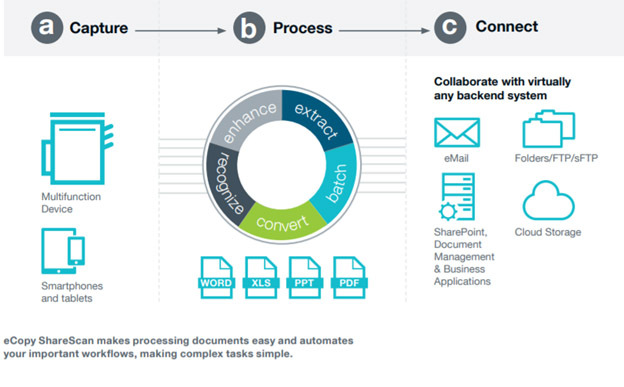 This easy-to-use software solution enables office workers to use Canon devices to turn paper documents easily and securely into digital information that is integrated into their communication, collaboration, workflow, and business applications.